For years, the most common type of filling used has been silver/amalgam. 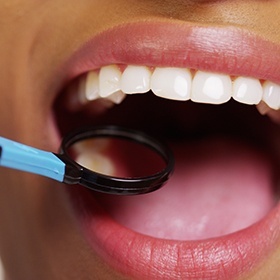 Though they are called silver fillings, they are actually about half mercury. In recent years, some research has questioned whether or not the mercury that is present in these fillings is hazardous. While no definite danger has been proven, some people are still very uncomfortable with the idea of putting these fillings into their mouth, especially when there are other alternatives. Dr. Swearingen doesn't use amalgam fillings. Instead, he prefers the more advanced technology of white composite fillings. While amalgam fillings are made up of metals, composite fillings are made of a combination of glass or quartz and resin materials which are blended, giving them a very natural-looking appearance. Because of the bonding technology involved, no healthy tooth structure needs to be removed in order to place the filling. The bonding also helps to restore the tooth's natural strength. Amalgam fillings weaken the tooth. They look like your natural teeth. People will not be able to tell which part of the tooth is a filling. Because they are not made of metals, composite fillings do not conduct hot and cold like amalgam fillings do. Therefore, there is less sensitivity to food and drink. If you are in need of a filling, you may click here to visit our request an appointment page, or you can call to set an appointment with our receptionist.